The food, the friends, the fellowship, the fun. Thanksgiving was a wonderful day at the Walters. Between breakfast, brunch, lunch, and dinner we hosted about 15 people in our tiny little condo. It was great! 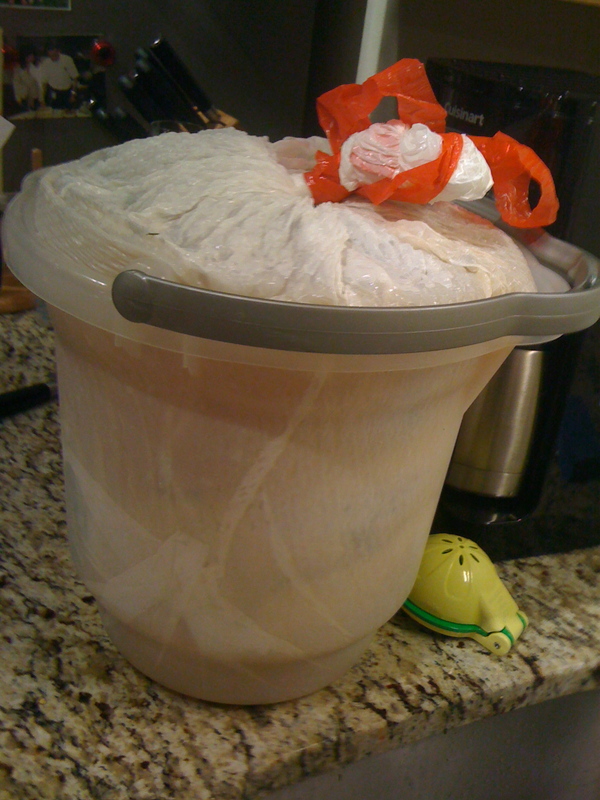 So, as promised, I did document the preparation of my turkey and brine. And so it begins, with a little brine action. This will be the delicious elixir that your turkey bathes in for up to 2 days depending on how fat is your bird. My bird was about 13/14 lbs so I let him soak in the rub for 2 days. His bath water is composed of a gallon of apple cider, couple quarts of water, cloves, all spice, dried chili peppers, garlic and bay leaves. Oh, and salt. The brine is all about the salt. Once the brine is ready, its time to but this bird in his bath. 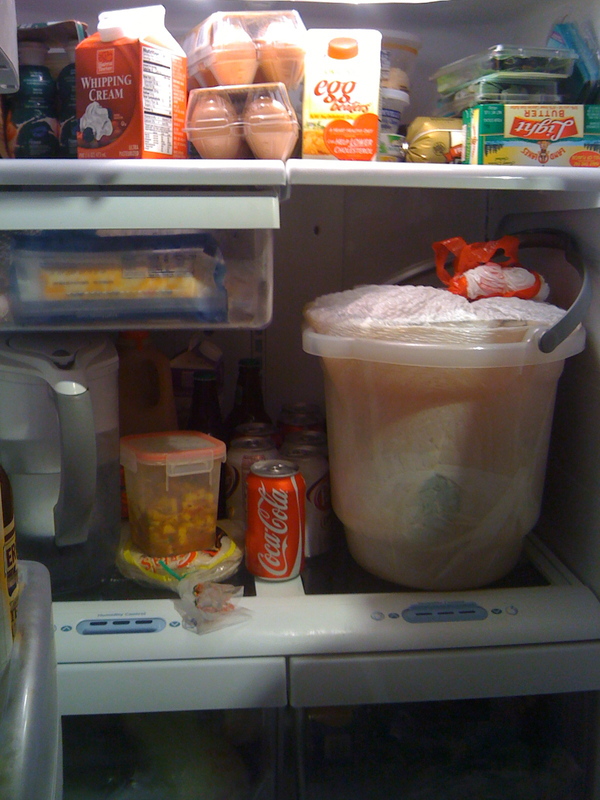 The tricky part of brining, especially for a city girl with a tiny fridge, is finding the right sized bucket for the bird to bathe and room in the refrigerator to leave the bird for two days. I use a 12 gallon trash bag in a 5 gallon bucket. 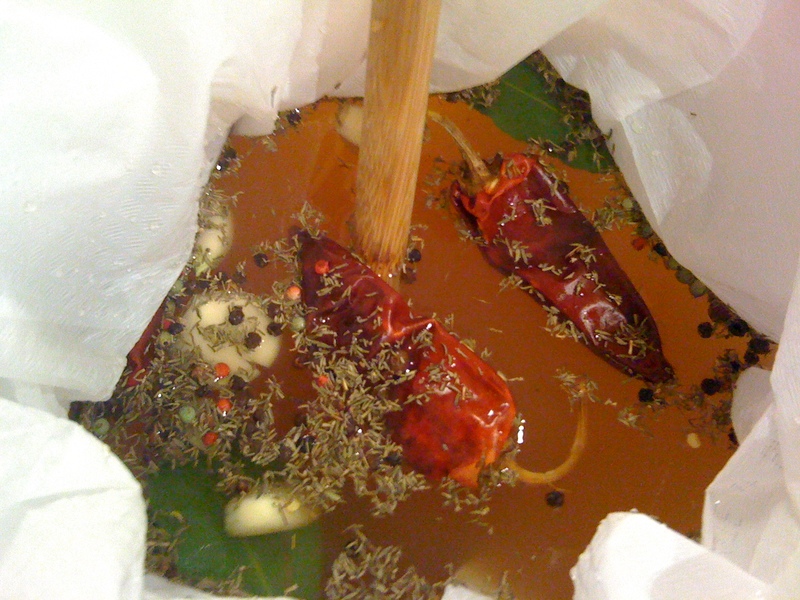 I start off by making the brine directly in the bag in the bucket. Its much easier that way because I also have little to no counter space. So in goes the cider and water, then all the spices and finally the bird. Before you put the bird in the bag be sure to dry him off good and also get all the packaged giblets and neck parts out of the cavity of your tom before you stick him in the brine. Trust me, having forgotten that step in the past, its much cleaner (and way less gross) to get those innards out pre-brine. Once you get the bird in the bath, draw up the garbage bag around him, get all the air out and tie the bag tight. Oh, I forgot something really important. Be sure to DOUBLE BAG this bird. It helps prevent leakage. Once he is sung in his bucket, in to the fridge he flies and stays PUT for 48-ish hours. Next up – wait it out. There really is no need to fuss over the turkey at this point. Just let him rest in his little bath and he will be succulent and juicy without any additional work on your part. 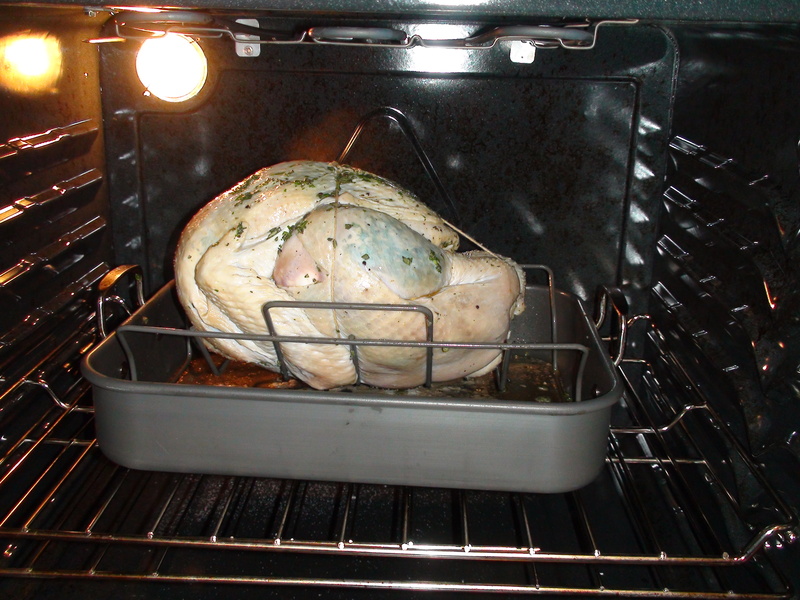 Fast forward to Thanksgiving day… the turkey is all ready for the oven. But before you just pop him in, there are a few additional things you can do to ensure a delicious return on your 2 day investment. Chop some sage and parsley and make an herb butter. I used about 3 tbsp each of the herbs and about half a stick of unsalted butter. Make sure to let the butter soften and bit… then add to a bowl with your herbs and stir with a spoon. 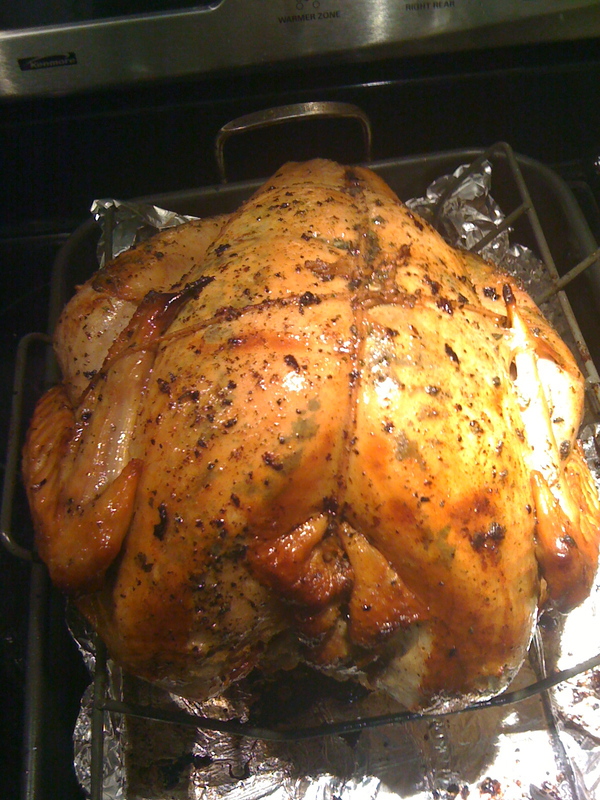 Once your herb butter is a nice consistency, rub the butter on your bird, INSIDE the skin. This can be tricky too, if your tom isnt thick skinned you may tear his skin. 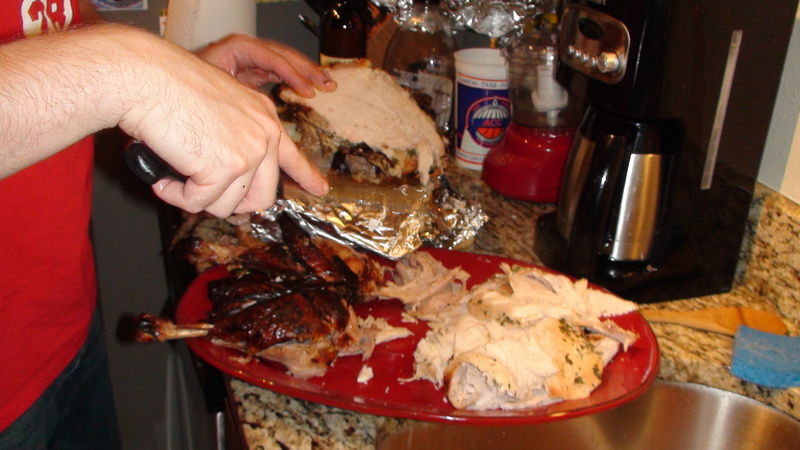 So take of all your rings (store them safely OUT of the kitchen to avoid disaster later) and separate the turkey skin from the breast with your hand. Be ginger, and try not to be too grossed out. The skin will separate pretty easily you dont need to force it. Once the skin is separated rub the meat under the skin with the herb butter. I heard this referred to as “putting on the turkey’s sun tan lotion” which is kinda weird to me but still makes sense. After I got his sun tan lotion on him, I stuck some aromatics in his cavity (onion, garlic, celery, bay leaves), tied him up tight, then rubbed the outside of his skin with EVOO, salt and pepper. Then into the oven! Then you cook him, on 325, for as long as he is heavy. When you bought him the label should tell you how long he needs to bake. Then you baste him every 20 minutes. I have cooked smaller birds upside down for the first few hours to get the good dark meat juices running though the breast meat. But this bird was heavier and not as easy to flip over as some of my smaller birds. So now your job is basting. I used a brush for basting but I think one of those squeezer things would work better. I didnt have one so a brush worked just as well for me. 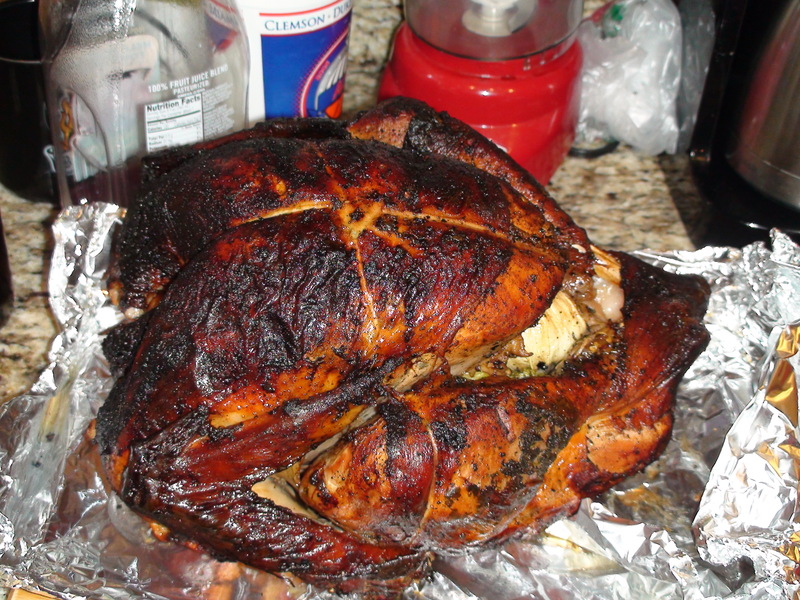 After hours of baking and basting the final result is to die for! Well, I hope you enjoyed this totally JV cooking demo of my turkey brine. I would love to hear your tips and trick and successes with brines or other types of turkey prep. Master Carver! Brian is great at getting that meat off the bone and onto the plate! That is one pretty bird!!!! One of my 2010 resolutions is to start at Supper Club – let’s chat about that soon….. Thanks girl! I want in on that SC!